Bring out the natural flavor of your favorite steaks, ribs and burgers with Mrs. 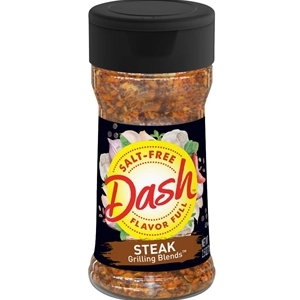 Dash Steak Grilling Blend. A salt-free, all-natural combination of coarsely ground peppers and seasonings, its bold taste brings fantastic flavor to any grilling occasion. 2.5oz.